A platform for sending targeted messages. "Customer.io allowed me to automate my emails"
With Customer.io I have automated the sending of emails, achieved more subscriptions to my list and my social networks YouTube, Instagram and Facebook, another advantage is that I have statistics in real time, something that other payment software is not possible and The best part is that you can try it for free. If you want great software that allows you to gain the trust of your followers, customers or students, Customer.io is ideal and here you have it for free so you can try it and make your audience fall in love with the attention it deserves. Permite automatizar campañas de marketing y enviar los correos a un gran número de clientes potenciales. Se puede integrar con otras herramientas existentes, enviar correos basados en eventos. Otra utilidad que me gusta es que puedo saber cuantos clientes han abierto un email, también la facilidad de distribuir la publicidad en un breve periodo de tiempo. Los informes podrían ser más completos, por ejemplo poder ver analíticas y estadísticas sobre los correos enviados. Otra desventaja con respecto a otros programas pueden ser las plantillas, no son especialmente llamativas o atractivas, y no permite customizarlas del todo, lo que puede llegar a afectar a campañas de marketing. Si buscas una herramienta con varias capacidades para enviar emails a numerosos contactos, publicitar tus productos, debes darle una oportunidad ya que cumple con estos requisitos y más. Automatización de correos publicitarios a una gran cantidad de personas con una facilidad increíble. Customer.io has two great things going for it. First, the platform is incredibly flexible. If you dream up an email campaign, there's a way to make it happen with Customer.io. Second, their customer support team is beyond compare. They provide rapid, personalized assistance and take your inputs to heart. I smile every time I see a new feature roll out that solves I problem I previously brought up with the support team. I mainly create campaigns and don't deal as much with logging user data to Customer.io, so I have to turn to my own development team to get new information logged, which can take some time. Writing campaign triggers based on Liquid code also involves a bit of a learning curve. Customer.io lets me automate all of our student-facing messaging, letting us provide accurate and timely information to our student body without the hassle of combing through endless streams of student data. With Customer.io, we're able to keep more students on track with their curriculum and improve student success. And whenever we need to add a new campaign or tweak an old one, Customer.io has the tools to make that possible. "Very Powerful, but not always Intuitive"
I like that you can pass custom data from your own product or users into Customer.io for use in segmenting users and in the copy of the emails you're sending. Even cooler is the ability to automatically trigger these campaigns based on a user's entrance into a segment or a specific action they take in the product. That's extremely powerful for our enterprise product. The competition set for this product really varies depending on your needs. I think customer.io is really powerful when compared with something like mailchimp or just sending gmail. But, I do think there are some strong contenders in the multi-channel automation outreach space that give customer.io a run for its money (Autopilot comes to mind). Customer.io helps us send automated platform emails without having as much technical maintenance of our own. It also helps us scale our product-centric marketing efforts. I think we can actually realize even further benefits from the product, and we're working on review those opportunities as we speak! The seamless integration between Customer.io and Segment has allowed our company to send emails intuitively based on specific triggers, filters, and logic. They also provide the tools we require for internal communication within Slack, SMS, Trello and more! With Customer.io emails are the product of logic, not assumption. What more can you want? Would be very nice to include a built-in email template builder. A WYSIWIG editor alone could suffice. As of now I am having to have these templates coded and then input into the source code section. Customer.io is re-defining the value of our emails. When you're a consumer and are identifying with a brand, it's important you aren't bombarded with emails at random, based on assumptions of the users journey. We also use Customer.io for internal notifications via Slack, SMS etc..
With Customer.io, I am able to sync real-time user data and setup email logic which is then used to communicate with users optimally. In understanding this, Customer.io has empowered us to setup campaigns for several key points in the user journey (e.g. onboarding, upselling, crosselling). "An Effective Email Marketing Tool"
What I like best about Customer. io is the possibility of personalization. There are many ways to personalize this email marketing tool. Segmentation is one of them: If you integrate Customer with your CRM or/ and other platforms it gets even more interesting. Let's say you have several campaigns for different products and specific audiences established in your CRM. By integrating Customer with your CRM you can send personalized campaigns to each audience and even pick which ones to track and how (converted rate, clicks, etc). The biggest disadvantage that Customer. io has Vs. other email marketing tools is the fact that their templates are not especially attractive. The templates are just functional. They don't offer beautiful graphic options, not even the fonts have many possibilities. Which is in a way a limitation for marketing campaigns, but probably not a big problem for follow up emails. I use Customer. io at least twice a week. We communicate with our customers in an effective way. We also review which campaigns, newsletters, etc. are working better. The options we have regarding the segmentation is key for us. Customer.io is one of the best email software I have ever used. When our company has a campaign we must send, Customer.io makes it an easy and smooth process. I also love the feature of seeing the "email status," so which makes tracking our newsletters and monitoring responsiveness easy. Very flexible program. A little tricky to learn / very technical but once mastered it is a highly beneficial and functional program. Other than that, there is nothing to dislike in my opinion about Customer.io. "Friendly and direct messaging to customers "
Being automatic is necessary nowadays and with this software I have the information of my clients at hand to improve the interaction between the brand and them. What I like most is the ability to visualize the behaviour of each user in the face of the strategies implemented, the progressive change and so analyze what to improve. I have tried other similar software more friendly when learning to use them. Also, I've had problems configuring it and setting up the right responses you need to send based on user behavior. Pay attention to all the available options, it is important to know what you want to do before you enter the platform. When you have access you will have a lot of messages from your customers to handle and it can be a little overwhelming. Interaction, brand loyalty and establishing new strategies to increase sales. We can create newsletters and campaigns for our clients quickly, either for a segmented group of clients or for a particular one, we can segment everything and manage it in an organized way. It also allows you to track the status of the emails (were they sent successfully, were they opened by the user, was a link within the email clicked) these features allow you to determine if an email was sent, if the user deleted it, etc. I honestly have nothing bad to say about Customer.io. Customer.io is ideal for email drip campaigns, provides statistics and trends based on customers/leads behavior. The powerful tracking and segmentation tool allow as communication with our customers to be more efficient and to we know what they need. "Easy and effective marketing automation"
It is a fast and efficient system, it gives us an automated way to launch our email marketing campaigns. The segmentation engine is the key feature of the software, it facilitates the process of sending newsletters and communications to groups of users, based on their preferences and the degree of interaction with our products and services. Moreover, Customer.io also allows us to export data in CSV, which facilitates the migration of customer databases to software platform.It also allows you to launch A / B testing easily. Meets our expectations, it gives us the solution to monitor our digital marketing campaigns. However, monthly subscriptions for small businesses are expensive. It meets the needs of businesses that need a digital solution to innovate and automate email marketing campaigns. Reports are key to identify trends, which is very useful to improve communication with customers, and to significantly increase the rate of conversions since we conduct campaigns based on user behavior. It is also an effective tool to measure the customer experience. "Hard to Setup, Easy to Use Later"
- Easy to define goals, workflows, triggers...it's so "smart"
Get ready to suffer on the setup. Is hard. If you want to track anonymous users, it's very complex and not elegant. But beneath that, it's very powerful. For us, workflows have infinite ROI (well, not that much, but A LOT). We use it to send behavioral emails (abandonment carts, welcome emails) and newsletter emails. It's very easy to use, the cost per email and user is cheap, the interface is smart, fast and lightweight. It is versatile, you have many options to segment. It's mainly an empty container with infinite options. It may seem overwhelming but for marketers it's the holy grail. "Customer.io is a powerful tool"
It has the ability to control the process of sending emails. It's great because it tracks the status of every email sent and actions by the user upon receipt. The analysis of these actions allow us to understand user behavior regarding the communications we send. This app is even more powerful and effective way to monitor marketing campaigns by email. No complaints about this app, I have not experienced issues. It is ideal for digital marketing teams, it allows you to save time and be more productive. Email marketing campaigns are more effective and productive. Customer.io gives us reports that help us to have a more accurate perspective on the interests of our customers. "Logiciel fonctionnant très bien pour le marketing"
Le logiciel permet d'automatiser des envois de mails et des campagnes marketing, il à tendance à toucher vraiment beaucoup de clients (potentiels), il peut aussi être combiné avec d'autres logiciels permettant d'être encore plus proche de la perfection. Permet aussi de savoir combien de personne ont ouvert les mails envoyés, pratique pour le marketing de masse et donc la vente dans une entreprise ! Si vous cherchez un outil facile d'utilisation et d'accès, fiable et rapide pour faire de la publicité à propos de vos produits, ce logiciel est fait pour vous et permet de tout réaliser parfaitement très rapidement et vous permettant encore plus que ce que vous pensiez à la base. Automatisation facile d'envoi de mails de masse et observation sur ces mails de masse (Combien ont été ouvert etc. ), bénéfices facile. This platform is WAY easy to navigate compared to what we were using beforehand. The UI is straightforward and creating a campaign with little time that looks sleek is not longer a task I don't look forward to. Their customer service is incredible, along with all of the resources available through their site to answer any questions you might have about information location or functionality. The templates leave more to be desired than those from competitors, but the ease of creating and sending out these e-mails makes up for the limitation. You can always design your own email template and input the source code. I use Customer.io about once a week to send out emails to our followers, and we are able to see which campaigns yield the best traffic results and sales. It's helped us tremendously with honing in and targeting our specific demographics while giving our company a professional look. "Very powerful email automation tool"
Customer.io has got some really powerful features such as advanced segmenting and liquid templating for email templates. The Slack integration is also really useful to get notifications about anything that's going on in your product/business. On the top of that, the support is great! Not much. I've already submitted my feedback to the support team about one or two little details and they have been very responsive about it. Customer.io allows us to automate all of our users' email onboarding and nurturing. We can adapt our emails to every segments of users. "Solid experience with Customer I/O"
The customer support team was incredible, always offering quick advice and even custom engineering support. Uploading custom email segments was not as easy as we would have liked and often resulted in emails to customer support. In reality, 80% of the emails we service are transaction and can be support with the pixel, but most systems can't support the super custom logic we use to power some lists. Customer I/O was being used as both our transactional and email promotions platform. The integration was incredibly easy, as was onboarding. We were up and running within days of signing the deal. "Great platform for custom emails based on sophisticated triggers"
Customer.io is very easy to use. It has a graphical interface for programming email sending rules that is relatively self-explanatory. So far, I haven't found anything about it to dislike. The difficulty in setup will vary depending on how technical your implementation is - make sure you have a dedicated engineering resource to puzzle through the steps. Customer.io allows us to automate and customize communications for enterprise clients of our white-label employee engagement product. It is fast, flexible, powerful, yet still simple enough that training new staff is relatively easy. I love the Ruby API! https://customer.io/docs/api/ruby.html We have some custom events that are not available from the JS snippet, so being able to add our own events through the API has allowed us to set up some awesome drip campaigns through Customer.io. Special mention for their adorable mascot. I haven't run into anything that I didn't like so far! Use the segment integration! It makes getting your users into the system take like 20 seconds and once you have Segment set up in your system, any new integrations (like Customerio) don't need to change your codebase. We are running multi-touch campaigns as part of a customer advocacy program and their 'Triggered' campaigns work incredibly well for this. Their segments + a campaign makes this really easy. I like the flexibility the service provide, nice and clear API and performance. The recent feature to copy items from one campaign to another is awesome. There is some lack of retry policy configuration, campaign can not be logically grouped (directories/sub-directories). I use customer.io to send significant amount of automatic comms to customers (~20K emails and SMS per day). The service is used to send marketing comms, reminder comms, etc. "It is a flexible, customizable and simple tool"
Customer.io is an effective and easy-to-use app. It is perfect automating email drip campaigns, its automatic activators and customization is its strength. It allows us to send series of personalized emails based on events, it provides statistics and trends to send emails based on the interests of our customers and leads. Its interface is user-friendly and integrates seamlessly with third-party tools. It is an excellent digital marketing solution. It is a great marketing solution. It is an efficient tool automating drip email campaigns. Es una herramienta digital que tiene todo lo que necesita. Ofrece automatización, sus mensajes se sentirán más personales cuando estén perfectamente sincronizados y activados con un avanzado motor de reglas. Crea grupos de personas similares usando información que usted sabe acerca de una persona, o características usadas para informarles de mejor manera. Customer.io ofrece además, información de perfiles de usuarios con un simple click usted podrá estar al corriente de todo lo que ese usuario ha hecho y como ha interactuado con los mensajes que le ha enviado. Por lo tanto, es fácil medir su éxito. Finalmente su diseño y personalización permite crear su propio código HTML o usar el de ellos con el uso de plantillas. "stay connected with your audience"
We use customer.io for B2C email marketing, specifically automatic and personalized triggers. It's use by marketing and sales primarily. It helps us communicate with customers and provide real-time and personalized information in a fast and automated way. For B2C companies, Customer.io is probably the best email product out there for high volume communication. I may be missing it in the UI, but a place to see the list of emails who qualify for a certain email. A few specific scenarios where Customer.io is well suited would be attempting to scale your email campaigns, personalize and trigger emails based off of events from your system. Companies who use Segment and other third party tools would be well suited as Customer.io integrates super easy with other tools. "Poorly Designed, Unwieldy Email Platform"
Not much. It does have the functionality to set up email campaigns, including drip campaigns. And it does have a basic email editor, allowing you to play with the layout of your email. But beyond having the 'basics,' it is not user-friendly and overall not well-organized. First, it isn't user-friendly. The UI is not intuitive, so it takes longer to find what you're looking for and accomplish what you're trying to do (compared to other email platforms I've used, such as MailChimp and Constant Contact). Secondly, the organization of 'environments' makes it difficult to manage one master list of email subscribers. Customer.io doesn't allow different 'environments' to interact with each other, nor share any data -- which can make it difficult to navigate subscriber lists, difficult to assess for duplicate subscribers, and difficult to report on email campaigns and analyze comparisons. The basic email editor is not user-friendly, and often slow to load. This platform does give you the ability to edit the HTML of an email directly, and I ended up directly editing the HTML nearly all of the time, in order to avoid using the clunky and confusing editor they provide. It seems like this platform can do the basic email functions a marketer would ask of it, but the organization, layout, and overall UI of the platform make it so cumbersome to use that it's far more frustrating to the user than helpful. Benefits include being able to send emails, being able to see stats after email campaigns are sent. The benefits don't outweigh the flaws in the platform. "Brilliant way to lighten the load for developers"
I love the fact that, as an engineer, I'm not constantly having to build specific product for our growth team, sales teams, customer service team, etc etc. There's not much that I dislike. I guess if I had to come up with something, it would be the steep cost. Well worth it, but the cheapest tier is currently $100. We use it to segment different email campaigns, notify members of bookings, receipts, pretty much any action based email trigger. It's been a time saver and engineering resource saver. Customer.io is great because it allows us to be more of a multi-channel organization where we can broadcast over different platforms - email and SMS - while keeping all of our customer data in one place. Some features are clunky and it feels like you have to do more manual work. There are more full features for email, but you can't apply them to SMS. Being able to have one system in place for multiple communication channels, and it helped reduce cost by consolidating. "Powerful, but not user friendly "
I do understand that this tool has a lot of power. It can do a lot of things that competitors like MailChimp can't do. However, I can't say that it's very user friendly. At least not at a high level. Once you get into the software and are comfortable with it, then it's manageable. But it's difficult to just pop right in and know how to use it. Make sure you have one person on staff who knows the product really well. You'll have to have someone who is able to teach the software to others. We're able to customize our email templates and create drip campaigns. Our favorite feature is the ability to A/B test email subject lines. "Customer.io is Easy to Set Up"
Customer.io has a user-friendly inteface. I like its responsive support team. It is the best email markerting that our company always depend on. Customer.io satisfies the needs of our firm. Yes. Customer.io is truly affordable because it is the most reliable tool for email marketing and management. For email marketing, Customer.io is the most reliable. I like its easy to use features. If you're looking to send emails based on user behavior this is one of the best implementations I've seen. It's also really easy to integrate with as a developer. It would be nice if Customer IO supported pulling data from external sources also. It would save us lots of development time. Switching to behavior based emails is excellent for conversion but it does require a good amount of engineering involvement to get the data you need. Customer IO lets us send behavioral triggered emails that are just impossible with many ESPs. •They do not support merging of duplicate profiles in any way. This product is not of much use for our company. "Great tool for email and workflow automation"
Easy to setup complex workflows that include emails and webhooks. Also love the support for liquid. No support on email design, but super easy to import pre-coded email. Make it easier to organize your campaigns. Better email design support would be great. "Better than mail chimp and cheaper "
I like the ability to sort contacts easily by where they are and the ability to set contacts to different aspects of customers such as, repeat orders, customer service etc..
Split use with mail chimp to obtain all features at a low price. Soon enough this will take over mail chimp. We used mail chimp which could get confusing for new employees in departments. With this constantly rolling it became a. Non issue and mail chimp is reserved for our seasoned professionals. This may very well fully take over with some work. "powerful but can get complex"
"Awesome marketing tool that we couldn't live without." Straight forward and clean application that's easy to work with and easy to set up. Connects with a lot of big other tools to use in tandem. Missing some integrations with smaller, less popular tools. The simple is not always the best, but the best is always simple. Keep things easy and understandable. Good Job! trigger based emails to follow up on users. "The best non marketing automation marketing automation tool"
I'm an early customer of Customer.io and am a big fan. While they don't necessarily bill themselves as "marketing automation", I have found that Customer.io can serve the role of a traditional marketing automation solution with trimmed down (but thoughtful) functionality at a great price. Their UX needs to catch up to the rest of the platform and new use cases. Customer.io has been most impactful for our onboarding and customer lifecycle programs. "Powerful CRM tool with very good UX "
Easy to use. Once you're set up, it actually doesn't take that long to get to grips with the tool. The logic is simple, the actions are easily executed and the results can easily be analysed. It is behind from a technical point of view (does not have the same capabilities to go the extra mile thanks to programmatic). Lacking some integrations (social media). ROI reporting could be improved. 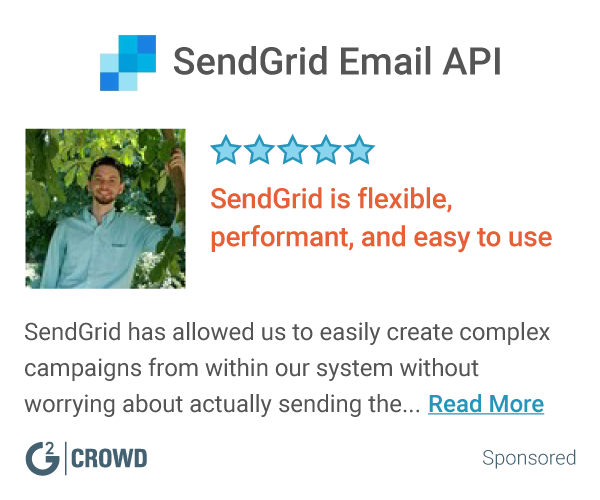 "The best email automation for user behavior based messaging!" Not really a whole lot. They are on the right track. This is THE email automation tool for transactional emails! We use Customer.io to send on-boarding emails to new users who sign up for our product. Once they become a customer we email them based on their behavior to target customer in need of help! I love how developer friendly Customer.io is - their new webhooks feature gives a lot of power and you always get the feeling that the platform is robust and well tested. I find that it falls a little in-between what we need - it's not quite marketing-centric enough to be our marketing automation tool, and it doesn't have the live chat option of something like Intercom. But I suspect these aspects will come with time. "I thought it would offer more flexibility, but it's actually quite limited." API is fairly simple to post user data, and event data. Shared objects like Newsletters, Segments, etc between 'Multi-Environments' is problem some. Refresh in interface is a bit slow. Search (ed) fields is limited to just email address of user. No branching logic in campaigns. Decent option, worth evaluating extensively. Tracking and engaging customer users, from Trial-Pay-Retain. We've enjoyed using Customer.io for our Saas business for many years. They integrate very well with our software and are very reliable. There isn't much we don't like about the product! Everything works smoothly and the opt-out process is simple for our lists. If you need comprehensive automation, this is the product. We follow up with customers that trigger different actions in our sales process. This is a great and easy platform to use. It allows me to send out my emails on time. "Customer.io is a great product to track mass communication"
I love that Customer.io enables me to see how many customers opened my emails. I also like the ease of distributing mass communication to our audiences. There isn't anything that I particularly dislike about the product, however, we have been using it for less than a year. If you currently don't track email activity, I recommend using Customer.io to start. I like the templates that you can build into Customer.io which make it easy to send out regular communication to specific audiences from various departments. Customer.io allows us to easily distribute mass communications to specific segments of our audiences and track their activity. Overall very easy to use: nice and clean interface and it's easy to set up campaigns. Out-of-the-box reporting tools are a bit lacking. No real customization. Need to pipe data into other programs to do any extensive analysis. One-off email campaigns, customer lifecycle email campaigns, webhook triggered emails directly from our database. C.io makes automation easier than most clients and offers powerful tools for technical users. We need a system to communicate to our customers with email. C.io is one of a few puzzle pieces we use to automate this process and make it easier. "An amazing email provider for B2C email marketing"
The customizable email triggers are amazing. They're simple to use, and you can set up custom workflows based on how your customers interact with you or your site. It doesn't have a fancy HTML editor like other platforms, but it's not really that necessary. "Great User Experience and always improving"
I really love the interface and the fact that they are constantly improving. It lacks some features and reporting is not very customizable. You might find it lacks some features but they're constantly improving, if you need marketing automation at a good price, Customer.io is a great tool. Automation and newsletters. Great plans. I love how you can automate things with Customer.io. You set up your triggered campaigns and all the work is done by the software. It's good for increasing the conversions and keeping your clients informed. It takes some time to get to know how to use it, but I guess it is just that triggered campaigns are not very easy to set up in general. "Good tool for lots of email"
pricing model lets us send an incredible amount of emails to our customers. Customer.io lets you segment your database and create trigger campaigns so you can send the right email at the right time. The analytics are not robust enough so you have to do a lot of digging to find the answers you want. connect with our customers and increase engagement. We can send many targeted emails to customers to encourage faster, and more successful on-boarding. "Super powerful yet simple tool"
Fairly easy to use, good for looking up user accounts to see which emails they've received. Changes were made and it's harder to search by an email address to find which emails were sent to them. Customer related concerns. Has helped us find emails and address potential product related issues. Thanks for your review! We released a few updates recently that returned partial email search to the UI...and we added attribute search as well for an all around better experience. * We monitor all Customer.io reviews to prevent fraudulent reviews and keep review quality high. We do not post reviews by company employees or direct competitors. Validated reviews require the user to submit a screenshot of the product containing their user ID, in order to verify a user is an actual user of the product. Hi there! Are you looking to implement a solution like Customer.io?